The fifth Independence (CVA62) was launched by New York Navy Yard 6 June1958- sponsored by Mrs. Thomas Gates, wife of the Secretary of the Navy;and commissioned 10 January 1959; Captain R. Y. McKroy in command. One of the newest class of "supercarriers" at the time of'her commissioning, Independence conducted shakedown training in the Caribbeanand arrived her home port Norfolk, 30 June 1959. She operated off the VirginiaCapes for the next year on training maneuvers, and departed 4 August 1960for her first cruise to the Mediterranean. There she added her great strengthto the peace-keeping power of the 6th Fleet in that troubled region, remainingin the eastern Mediterranean until her return to Norfolk 3 March 1961. Theremainder of the year was spent in training and readiness operations offthe Atlantic Coast. Independence sailed 19 April 1962 for 6th Fleet Duty in support of PresidentKennedy's firm stand on Berlin during a reoccurrence of stress in a criticalarea. She returned to Norfolk 27 August and sailed 11 October for the CaribbeanSea. She arrived off Puerto Rico in response to the Communist defiance inthe Cuban Missile Crisis and took part in the quarantine operations whichfinally forced withdrawal of the Russian missiles. She then returned toNorfolk 25 November for readiness exercises along the eastern seaboard,overhaul in the Norfolk Naval Shipyard, and refresher training out of GuantanamoBay. Independence departed Norfolk 6 August 1963 to take part in combine dreadiness exercises in the Bay of Biscay with sea-air units of the United Kingdom and France then entered the Mediterranean 21 August for further duty with the 6th Fleet. Cruising throughout the Mediterranean, she gainedmuch valuable experience during combined NATO exercises, including close air support to Turkish paratroops, reconnaissance, communications, and convoy strike support. President Makarios of Cyprus paid her a visit 7 October,after which she joined in bilateral U.S.-Italian exercises in the Adriatic with Italian patrol torpedo boats, and U.S.-French exercises which pitted her aircraft against French interceptors and a surface action with French cruiser Colbert. She returned to Norfolk 4 March l964. Following training exercises ranging north to New York and south to Mayport,Fla., Independence departed Norfolk 8 September 1964 for NATO "Teamwork"exercises in the Norwegian Sea and off the coast of France thence to Gibraltar.She returned to Norfolk 5 November 1964 and entered the Norfolk Naval Shipyard for overhaul. The first Atlantic Fleet carrier to deploy to the South China Sea insupport of Vietnam operations, Independence and her embarked Air Wing 7 received the award of the Navy Unit Commendation for exceptionally meritorious service from 5 June to 21 November 1965. They participated in the first major series of coordinated strikes against vital enemy supply lines northof the Hanoi Haiphong complex, successfully evading the first massive surface-to-airmissile barrage in aviation history while attacking assigned targets, and executing, with daring and precision, the first successful attack on anenemy surface-to~air missile installation. 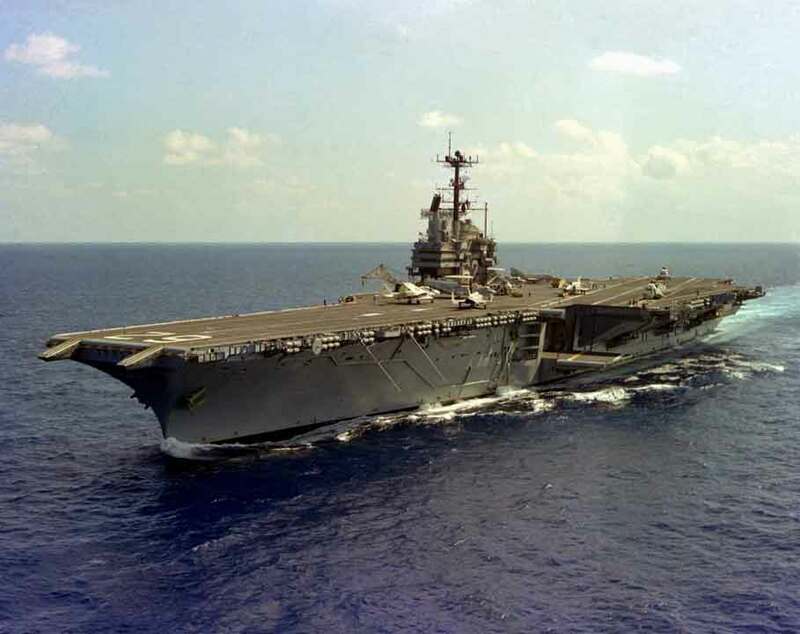 The carrier launched more than7,000 sorties in sustaining an exceptional pace of day and night strikeoperations against military and logistic supply facilities in North Vietnam. "The superior team spirit, courage, professional competence, and devotion to duty displayed by the officers and men of Independence and embarked Attack Carrier Air Wing 7 reflect great credit upon themselves and the United States Naval Service." Independence returned to her homeport, Norfolk, Va. in December, arrivingthe 31st. During the first half of 1966, she operated off Norfolk, replenishingand training air groups. On 4 May she participated in Operation STRIKEX. "The carrier departed Norfolk 13 June for European operations with the 6thFIeet. Independence was involved with unit and NATO exercise from July intoDecember. She then continued her 6th Fleet deployment into 1967. On 25 September 1970, word was received that Gamal Abdul Nasser, President of the United Arab Republic had died; an event that might plunge the entire Middle East into a crisis. Independence, along with USS John F. Kennedy (CV 67), USS Saratoga (CV 60), and seven other U.S. Navy ships, were put on standby in case U.S. military protection was needed for the evacuation of U.S. citizens and as a counterbalance to the Soviet Union's Mediterranean fleet. Pilots of VMA-142, -131, and -133 began qualification landings in A-4 Skyhawks aboard Independence on 3 August 1971. For the next three days, four active duty and 20 reserve pilots operated aboard the carrier  the first time that Marine Corps Air Reserve Squadrons qualified in carrier duty. In May 1973, President Richard M. Nixon delivered his annual Armed Forces Day address from the decks of Independence. While based in Norfolk, the ship made deployments to the Mediterranean Sea and Indian Ocean. From 8 to 13 October 1973, Task Force 60.1 with Independence, Task Force 60.2 with USS Franklin D. Roosevelt (CV 42), and Task Force 61/62 with USS Guadalcanal (LPH 7) were alerted for possible evacuation contingencies in the Middle East. The ships were on alert as a result of the 1973 Yom Kippur war between Arab states and Israel. Independence operated off the island of Crete. On 20 June 1979, Lt. Donna L. Spruill became the first Navy woman pilot to carrier qualify in a fixed-wing aircraft. Lt. Spruill piloted a C-1A Trader to an arrested landing aboard Independence. In 1982, Independence provided critical support to the multinational peacekeeping force in Lebanon. On 25 June, the greatest concentration of U.S. Navy air power in the Mediterranean Sea resulted when the battle groups of USS Forrestal (CV 59) and Independence joined forces with USS Dwight D. Eisenhower (CVN 69) and USS John F. Kennedy (CV 67). After steaming together in the eastern Mediterranean Sea for several days, Forrestal and Independence relieved Dwight D. Eisenhower and John F. Kennedy, the latter sailing home to Norfolk, Va., after a long deployment. On 25 October 1983, aircraft from Independence's embarked air wing flew missions in support of Operation Urgent Fury, the action to liberate the Caribbean nation of Grenada. Returning to Lebanon that same year, the ship's air wing conducted air strikes against Syrian positions. On 17 February 1985, Independence arrived at the Philadelphia Naval Shipyard to undergo a modernization and overhaul program to extend her service life by 15 years. The flight deck was improved to allow the recovery of high-performance aircraft while the ship traveled at slower speeds, and the NATO Sea Sparrow launchers were upgraded. Other improvements improved the ship's fuel consumption. Independence completed the Service Life Extension Program (SLEP) at Philadelphia Naval Shipyard in June 1988. Setting sail 15 August from Norfolk, the ship transited the tip of South America and arrived at her new homeport of San Diego, Calif., 8 October. In August 1990, with Carrier Air Wing Fourteen embarked, Independence was sent to deter Iraqi aggression during Operation Desert Shield. Arriving on station in the Gulf of Oman on 5 August, Independence was the first carrier to enter the Arabian Gulf since 1974. The ship remained on station for more than 90 days and permanently reestablished a U.S. naval presence in the region. She returned to San Diego on 20 December 1990. Independence changed homeports again on 11 September 1991  this time to Yokosuka, Japan, embarking Carrier Air Wing Five and becoming the Navy's only permanently forward-deployed aircraft carrier and flagship for Commander, Carrier Group Five. On 23 August 1992, Independence entered the Persian Gulf prepared to enforce an Allied ban on Iraqi flights over south Iraq below the 32nd parallel. On 26 August President George H. W. Bush announced that the United States and its allies had informed Iraq that in 24 hours Allied aircraft would fly surveillance missions in southern Iraq and were prepared to shoot down any Iraqi aircraft flying south of the 32nd parallel. The action was precipitated by Iraqs failure to comply with U.N.Resolution 688 which demanded that the Iraqi government stop the repression of its Shiite population in southern Iraq. Persian Gulf allies began to enforce the ban on Iraqi planes from flying south of the 32nd parallel on 27 August in Operation Southern Watch. Any Iraqi planes that violated the ban would be shot down. Twenty Navy aircraft from CVW-5 aboard Independence in the Persian Gulf were the first coalition aircraft on station over Iraq as Operation Southern Watch began. Southern Watch was the enforcement of a ban on Iraqi warplanes and helicopters from flying south of the 32nd parallel. Independence became the oldest ship in the Navy's active fleet, and the first carrier in history to hold that distinction, on 30 June 1995. With this honor, Independence displayed the Revolution-era First Navy Jack, commonly called the "Don't Tread On Me" flag, from her bow until her decommissioning. The flag was presented to Indep[endence commanding officer Capt. David P. Polatty III in a formal ceremony on 1 July. The flag was received from USS Mauna Kea (AE 22) upon her decommissioning. In November 1995, the Independence and Carrier Air Wing Five team returned to Japan after successfully completing their third deployment to the Arabian Gulf in support of Operation Southern Watch. In March 1996, Independence was called upon to provide a stabilizing presence during heightened tensions between Taiwan and China. Upon returning to Yokosuka in April 1996, the ship was visited by President Bill Clinton as part of an official state visit to Japan. In 1997, Independence made a four month deployment, covering several major exercises and seven ports of call. Included in these ports of call were two historic port visits. The first was 28 February 1997 to the island territory of Guam. Independence was the first aircraft carrier to pull into Guam in 36 years. The second, two months later, was to Port Klang, Malaysia. Independence became the first aircraft carrier in the world to make a port visit to Malaysia. Before sailing back to Yokosuka, Japan, Independence made its last port call of the deployment in May 1997 to Hong Kong. Independence's port visit was the last U.S. naval port visit to the territory before its reversion to China on 1 July 1997. Independence deployed to the Arabian Gulf in January 1998 to support negotiations between the UN and Iraq and to again participate in Operation Southern Watch. Independence was decommissioned in ceremonies at the Puget Sound Naval Shipyard in Bremeerton, Wash., on 30 September 1998. Independence's commissioning pennant was hauled down 39 years, 9 months and 20 days after it was first proudly hoisted, and the "Don't Tread on Me" jack was transferred to the Navy's next oldest active ship, USS Kitty Hawk (CV 63).